The latex allergy test checks for IgE antibodies related to a latex allergy. What is a latex allergy test? A latex allergy blood test measures the latex IgE antibody blood levels. Why is a latex IgE test important? This latex IgE blood test can help identify a latex allergy. This Latex Allergy Test is a blood test. This latex allergy test, also known as a latex allergy blood test and a latex IgE test, measures the latex IgE antibody blood level. Latex has historically been made from the sap of the rubber tree. After repeated use of latex, one can develop a sensitivity to latex and the proteins in natural rubber latex can cause an allergy. Because latex is used in a wide variety of industrial products, and especially medical and dental products, people such as healthcare workers are at a higher risk for developing a latex allergy. Latex allergies can cause symptoms similar to traditional mild allergies - red eyes, runny nose and sneezing - and can also be more severe and cause trouble breathing. 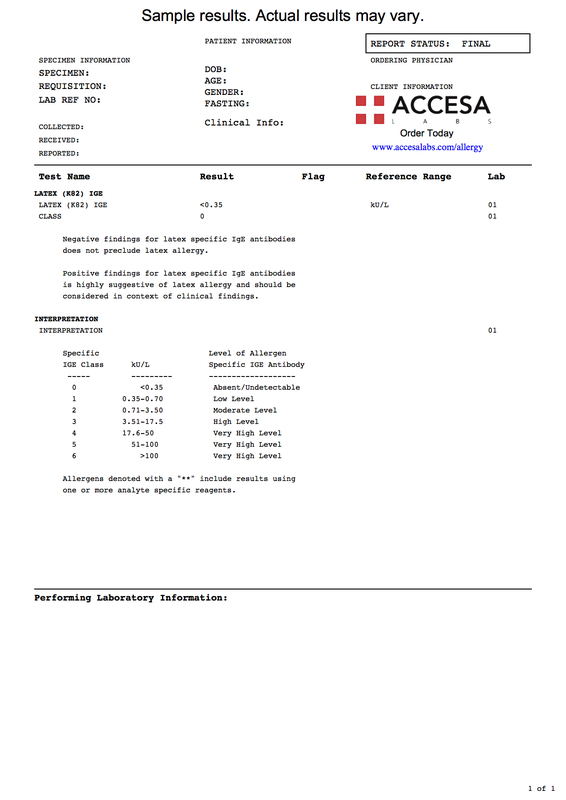 This latex IgE test uses the ImmunoCAP® lab methodology. IgE blood test results are reported in kU/L and can be compared against the IgE antibody reference range provided by the lab to determine the IgE allergy class to latex. This latex allergy blood test is less painful and has less side effects than historical allergy testing methods such as the skin prick test (SPT). In the skin prick, or scratch, test, serum containing latex components are injected into the skin. If you are allergic to latex, you will, unfortunately, have a mild allergic reaction and all of the symptoms that go with it. Instead, this allergy blood test can check for the latex allergy without causing an allergic reaction, resulting in a much more comfortable lab testing experience through a simple blood draw. Latex Allergy Test at Guaranteed Prices.